Chelsea forward Diego Costa's refusal to return to training is "disgraceful", says former Arsenal striker Ian Wright. The 28-year-old, who is currently in his native Brazil, said he has been treated like a "criminal" and wants to join former club Atletico Madrid. Chelsea boss Antonio Conte texted Costa in June to say he was not in his plans, but Costa says he has been told to return and train with the reserves. "I don't understand how players can get away with that behaviour," said Wright. Spain striker Costa was given extra time off by Chelsea last month, but now claims he is being fined for his absence and is considering legal action or seeing out the remaining year of his contract unpaid in Brazil. The Blues expect Costa to return immediately, resume training, get himself match fit and put himself in contention for selection, because he is still contracted to the club. "It's disgraceful the way he is behaving," Wright told BBC Radio 5 live's The Monday Night Club. "Surely he's got to come back here, so if the manager changes his mind he's there. He's earning a fortune at Chelsea. Can Atletico Madrid even afford him?" 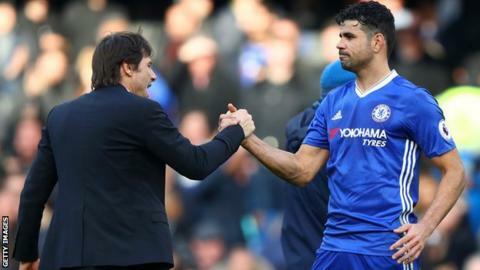 Costa, who last played for Chelsea in the FA Cup final in May, joined the Blues from Atletico Madrid in 2014 and has won two Premier League titles and the League Cup with the London club. In January, he was left out of the side for an away match at Leicester after he was involved in a dispute with a fitness coach. It followed reports of an offer from China that would have been worth £30m a year in salary. "Why won't they let me go if they don't want me?" he told the Daily Mail on Monday. "In January, things happened with the coach. I was on the brink of renewing my contract and they put the brakes on it. I suspect the manager was behind it. He asked for that to happen. "His ideas are very fixed and clear. I have seen the sort of person he is. He has his own opinion and that will not change." "Antonio Conte has told me by message that I do not follow at Chelsea and that's it. Conte said he did not count on me for next season," said Costa in June. That came after the Italian manager had sent a text to his players wishing them a good holiday and telling them to stay fit and Costa replied in a jokey way. But Wright says he cannot understand why Chelsea would want to get rid of a forward who scored 20 goals in 35 Premier League games to help the Blues win the Premier League last season. "Something has happened," added Wright, who played 33 times for England. "For them to want to get rid of that kind of player, I can't understand how that's come about. I can't understand why you would get rid of definitely 20 goals? It doesn't make sense to me." Following the text message exchange with Conte, Costa said "I love to live in Madrid", despite Atletico being banned from signing players until the January transfer window. "Why does it seem he is holding all the cards? He genuinely wants to go, but only wants to go to Atletico Madrid," added Wright. "If Chelsea want to get rid of him and get bids for a player they don't want, they're not going to take them? "I would like to see the text. Show us the text. Then I don't blame him, because I would have the hump over that." Costa said: "I have not deleted the message. If people accuse me of lying, I can show them. It was clear, saying that he didn't count on me and wishing me the best for the future. Full stop." Former Chelsea and Republic of Ireland midfielder Andy Townsend says Conte telling Costa he is not wanted at the club is like Manchester United, Arsenal and Tottenham telling their star forwards not to return. "Something else is going on," he said. "There's no logic from Chelsea's point of view to get rid of him. "You don't send him a text and say 'off you pop, we don't want you to come back'. They don't do that. They don't just turn round with one of their main components and say 'go and find a new club'. "It's like Jose Mourinho saying to Zlatan Ibrahimovic before he was injured, Arsene Wenger saying to Alexis Sanchez, Tottenham saying to Harry Kane 'don't come back'. It's the hardest thing to do, score goals, and you cannot afford to be that flippant with players like that."